The above image is a blow up of a number of hexagon cells that goes into the make up of the entire VTA (vacuum thrust aircraft) outer surface. The entire outer surface of the VTA is coated in multiple hexagon cells that are manufactured together in one process. A single cell consists of a tiny geiseller or crookes vacuum tube. 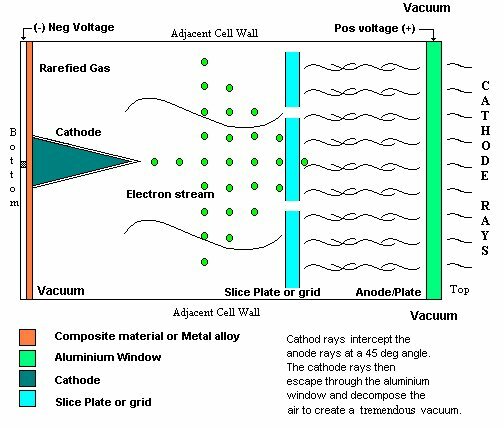 The cross section shown above is a blow up of a single hexagonal cell within the outer surface of the craft Each tiny cell is in fact a geisler or crookes type of vacuum tube manufactured in a multiple process to produce the overall outer layer of the craft.